The WhimWham Unicorn Cupcake Zombie 8-Inch Plush! Unicorn has been given a zombie makeover and that cupcake is none too happy! What do you get when you take 3 pop-culture trends and throw them into a blender of silliness? A WhimWham! 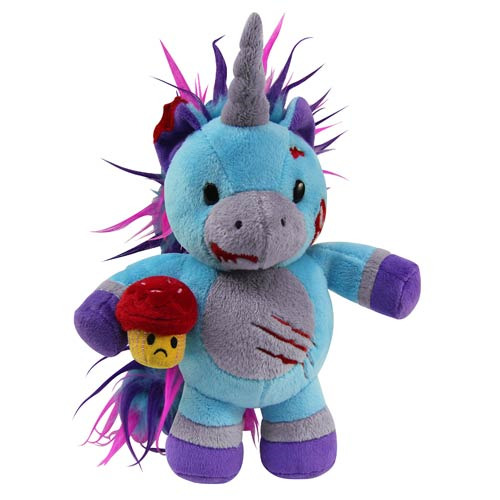 This adorable WhimWham Unicorn Cupcake Zombie 8-Inch Plush is a mish-mash of cuddly happiness. Unicorn has been given a zombie makeover and that cupcake in his right hand is none too happy! The WhimWham Unicorn Cupcake Zombie Plush measures 8-inches tall and sports some pretty awesome pink, light blue, and purple hair. Ages 13 and up.